For decades, our Parish has provided us with a home, a family, and a sense of community. As parishioners, we are well aware of the abundant uses, and many challenges, that St Francis Hall provides. And we recognize the potential that this historic building still has to offer. Currently, St. Francis Hall is used for Parish-wide activities including, family and community receptions, ministry meetings, guest speakers, bingo and presentations, performances, and religious education. However, due to its industrial aesthetic and aging physical foundation, the current space offers limited functionality and leaves much to be desired by our parishioners and renters alike. 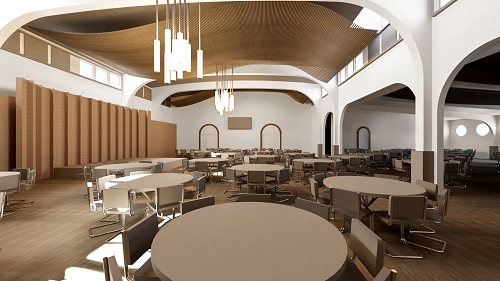 Through this campaign, and the efforts of our entire Parish, we will create a more functional and attractive St. Francis Hall to hold our large Parish activities, facilitate meaningful connections with our community and friends, and create an engaging environment to support both religious education and community outreach. Replacing and upgrading the lighting, renovating the flooring, and repainting the walls to create an environment that is both warm and welcoming. Installing a vaulted, wood-panel ceiling to improve sound quality and convert the industrial, unfinished hall to an aesthetically pleasing and completed space that is both functional and beautiful. Purchasing new acoustic panels and an upgraded sound system to further enhance sound quality and enable parishioners, guests, and community members to clearly hear, understand, and enjoy the full impact of the experience. Installing a soundproof room divider that will allow us to simultaneously utilize the space for multiple groups, activities, and events. Enhancing our user experience and incorporating purposeful storage by relocating and constructing a new, portable stage in the middle of the east end of the Hall—increasing the visibility of the stage, the usability of the entire space, and availability of engagement. The ultimate goal of this Community gifts campaign, a first for our Parish in many years, is to be a unifying force, improve the Parish, and create a foundation for a much more viable fundraising future for our Parish. The campaign will rely on the commitment of volunteers and the generosity of our members to reach the $710,000 goal through donations and pledges, payable over three to five years. As members of the Mission San Luis Rey Parish, we are being called upon to ensure that our Parish remains strong and vibrant today, tomorrow, and well into the future! Should we exceed our goal in this Community gifts campaign, we will complete additional improvements to St. Francis Hall, including the men’s bathroom and video capabilities. This ambitious plan represents a new and exciting chapter for Mission San Luis Rey Parish. It has been years since we have been challenged to come together and invest in our faith community, and in the future of our Parish, in such a significant way. The call is clear, and the time to prepare for a vibrant and lasting future is now. Together, we will create a positive foundation for our Parish to flourish!